I know there are a lot of similarities between these two fish, but getting them mixed up is one of my largest pet peeves. Maybe this is because I’ve kept both species of fish for many years. Maybe it's because I dislike people who don't bother to think about what they are seeing. Either way, I would like to point out the major differences between koi (Cyprinus carpio) and goldfish (Carassius auratus auratus). 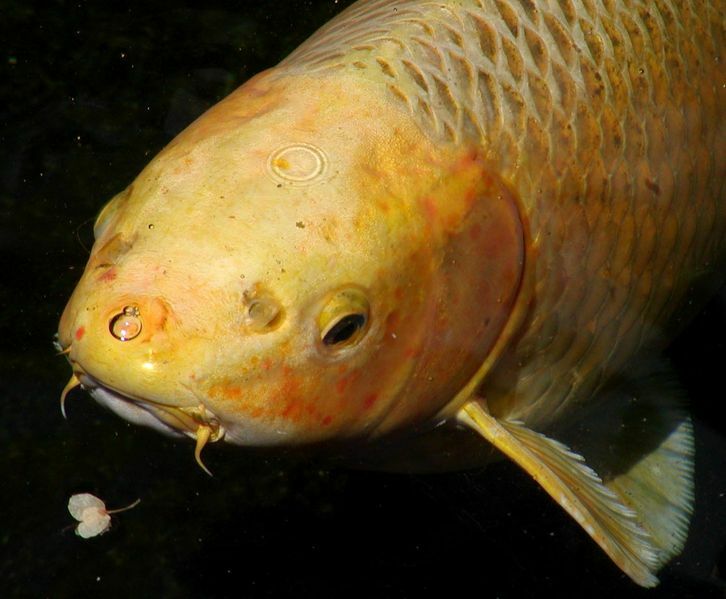 This is the most obvious difference between adult koi and goldfish. If you see a colorful fish in a pond that is larger than 15 inches, it is a koi. Fishbase.org lists 12.5 in (32 cm) as the maximum size for goldfish while it lists 43 in (110 cm) as the maximum size for koi. Younger specimens in ponds can be more difficult to tell apart, though, so this isn't always reliable. 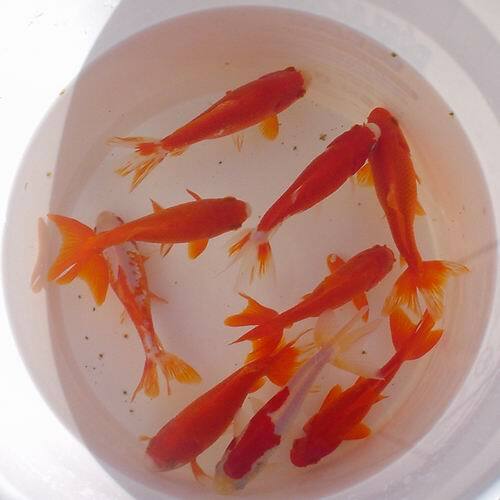 Goldfish are pretty limited in their patterns and colors whereas koi have a much wider variety. Goldfish tend to come in solid colors of orange, white, black/blue, or red. Yellow can be seen but is very uncommon. White and black combinations and red and black combinations are also possible but rare compared to the common red and white combination. Koi come in a much greater variety of common combinations. The base colors are red, white, black, yellow, orange, and blue. 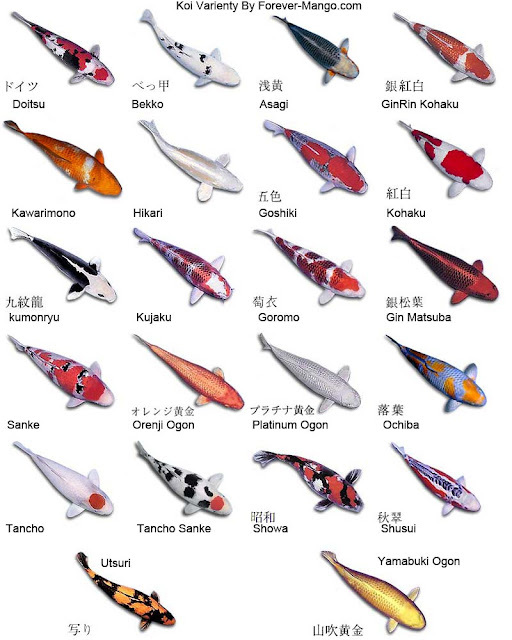 The chart below illustrates some common koi colorations and the names of the patterns. This is the most obvious difference between koi and goldfish. Koi will have these barbels and goldfish will not. If you can see these on a pond fish, that fish is a koi. However, these aren't always easily observable. Both koi and goldfish can have elongated tails, but only goldfish will have the signature double-tail. This is where the caudal fin (tail fin) is doubled. From above, this will often give the tail a three-pronged or a four-pronged appearance. This characteristic is only found in goldfish. 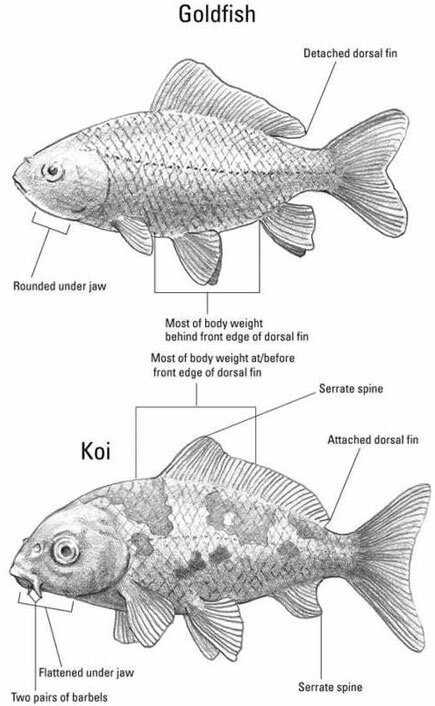 This illustration below points out more of the morphological differences between koi and goldfish. Often times these aren't visible unless you view two fish side by side or have looked at a lot of koi and goldfish. The difference in mouth is often visible when you feed them. Sometimes it will give you a chance to look for barbels, too. Yes. When found in the same habitat (either in the same pond or in the wild), the two species will hybridize, but the hybrids are infertile. Often times these hybrids will be the natural brown, but some can come out a beautiful solid black. When these are found in the aquarium trade, they are often breeding mistakes. I hope you now have a better understanding of the differences between goldfish and koi. These are two beautiful fish that deserve to be recognized for their own merits. 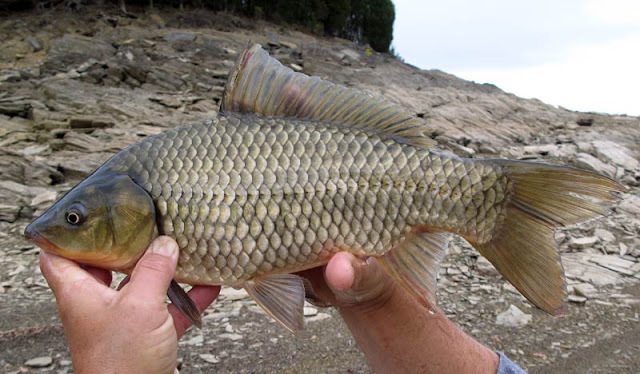 Well Goldfish are part of the Carp Family but it is amazing how they look different. You can see from breeders how they are now breeding Koi with Goldfish, sometimes it's getting more difficult to tell whats a true Koi or a mixed breed. Very helpful! Thanks for the info. Thank you so much! I have been searching the web trying to find something about the double tail! I do have baby koi but mixed in are gray babies with a tri-tail, two tails developed but didn't split. We have a few goldfish mixed in with Butterfly koi. I was surprised since we just redid our pond and these are all 3-5 in. fish, but within 3 weeks there were babies that looked different from our guppies (for the turtles). Now just under 3 months, we have 4 generations and I believe 3 are koi. THIS was GREAT! At our ranch, I have three ponds with Koi and goldfish. I can usually tell the difference, but this was made it so much easier! If they are so hard to tell apart, why are koi so much more valued? other than more limited color variations, i find the goldfish morphology more elegant in many ways. I have one hybrid that I found in my pond and I agreed that they won't breed because the hybrid in my pond did not breed even it is already 3 years old. We have a small pond with nothing but goldfish. We are in zone 4 and the goldfish are very hardy for the winter as long as a hole is kept open in the ice and a "bubbler" is used during the winter to keep the oxygen levels up. We started with 7 goldfish seven years ago, and they have been "fruitful and multiplied" so that we now have 60 goldfish in the pond with various - normal for goldfish - color combos. 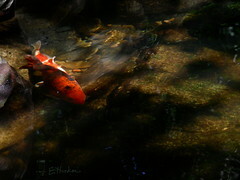 Cheaper and easier to maintain, and just as beautiful to watch as koi, and they are often mistaken for koi by visitors. Always wondered why koi were so valued as compared to goldfish (maybe because they aren't as easy to maintain and have those additional color combos? ), but to each his own! How about butterfly koi is this strain a hybrid of koi and goldfish? Butterfly koi are not a goldfish/koi hybrid. They are simply a variety of koi that has been bred for long fins like the common Betta splendens is. Thank you for your response. What are their ancestors? how did they develop their long fins? I believe they were derived from the short-finned koi. The trait appeared a few times and was bred into the lines. I can't offer much more than that as I do not have a strong genetics background. I think your right in their, since the beautiful colored kois that We enjoyed today are just products of mutation of the wild carps. Thank you for your response.